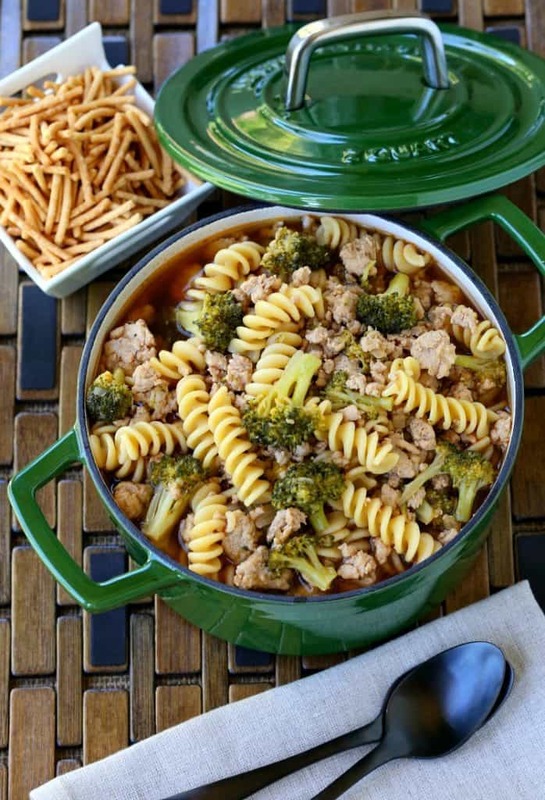 Skip ordering take out and make this Chicken and Broccoli Soup at home instead! 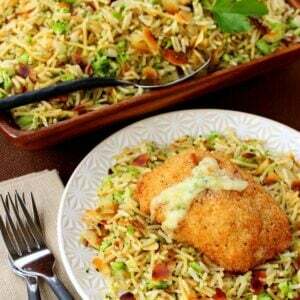 A much healthier version of your favorite take out dinner! We love ordering Chinese take out. We actually don’t do it that often because of all the food we cook here for the site, so there’s always something for dinner. But the other reason is that we don’t live in an area that has a lot of take out places close by. Like the closest take out place is at least 15 minutes away, so it’s usually something one of us picks up on our way home from somewhere. 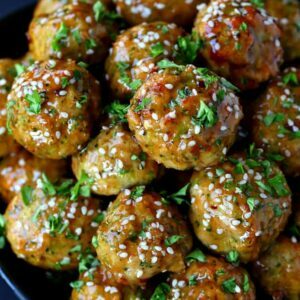 So when we have the taste for those awesome take out flavors we usually whip something up at home like a stir fry and some version of fried rice with whatever we have in the fridge. You’d be surprised how many different fried rice recipes you can make just by using up the vegetables and leftover meat in your refrigerator! We do it ALL the time. 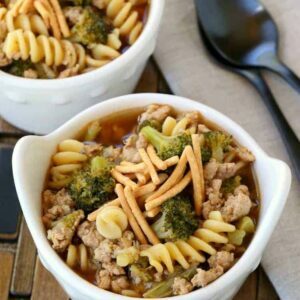 This Chicken and Broccoli Soup recipe couldn’t be easier to make, and our boys flipped over it so that’s a win win for me. 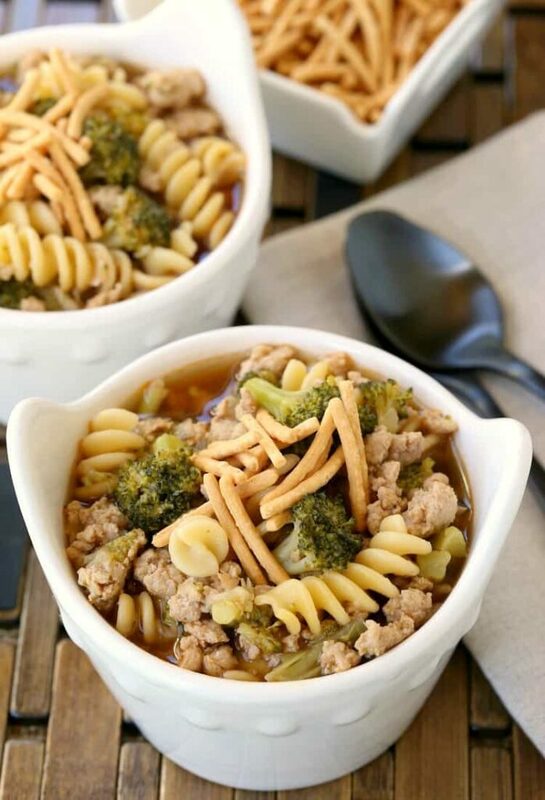 Start out by cooking ground chicken with onions and garlic, then add in broccoli florets with beef broth and chicken broth to steam. 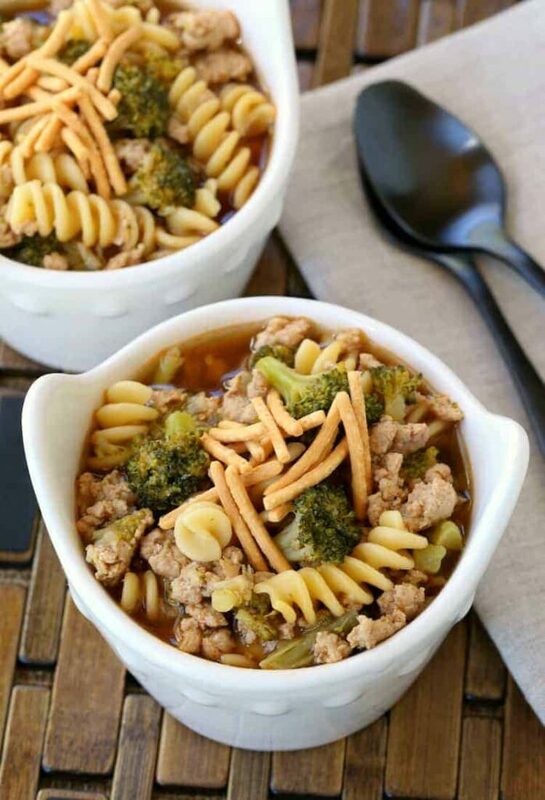 If you want to keep the broccoli really crispy you can steam it separately and then add it to the soup before serving, just depends on what you like. 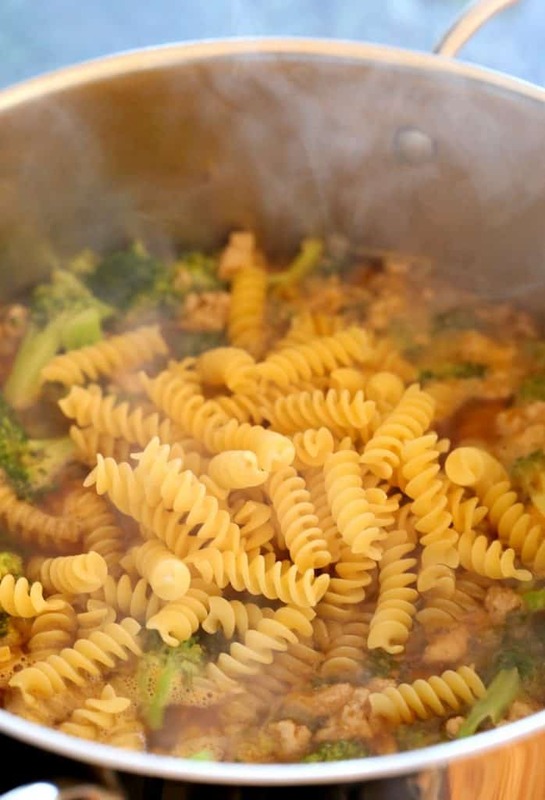 Then you can add the pasta – we used rotini but you can use any tube shape pasta or even ramen noodles. Now it’s just 15 minutes until soup time. Just let the pasta cook down in the broth and then it’s time to serve. If you like you can add these crispy wonton noodles to the top of your soup for garnish and a little crunch! 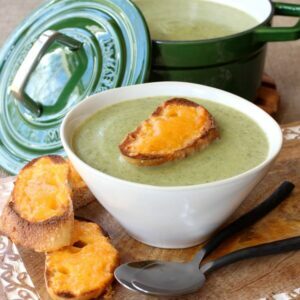 I have to tell you, I’ve never seen my little guy gobble up broccoli the way he did when he ate this soup. And I guess I can go ahead and say the same for myself! Add oil to a large soup pot over medium heat. Add the ground chicken and salt and pepper. Brown the chicken, breaking up with a spoon until there is no longer any pink in the meat. Add the onion and garlic, stir to combine and cook for 5 minutes. 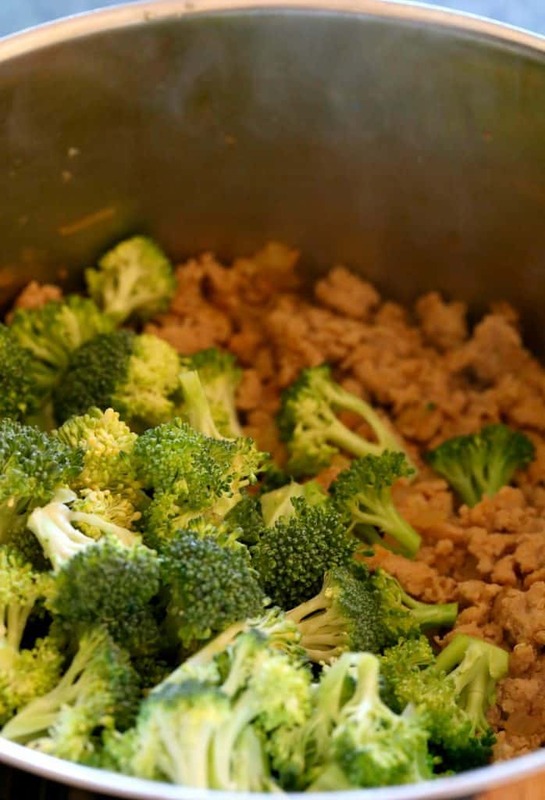 Place the broccoli in the pot, pour int the beef broth and cover to steam for 5 minutes. 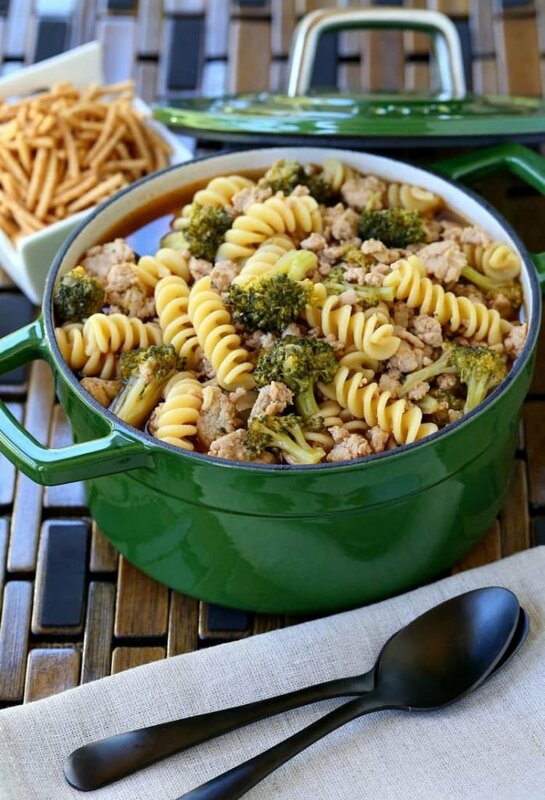 Remove the cover and stir the broccoli together with the meat. Pour in the chicken broth, soy sauce, sesame oil and sriracha and stir. Add the pasta, stir, then cover and simmer for 15 minutes.Remove the lid, adjust the soup for seasoning and serve. You can also steam the broccoli separately and add it to the soup when it’s finished cooking if you want the broccoli to be more firm.